Every attendee must complete an individual registration. 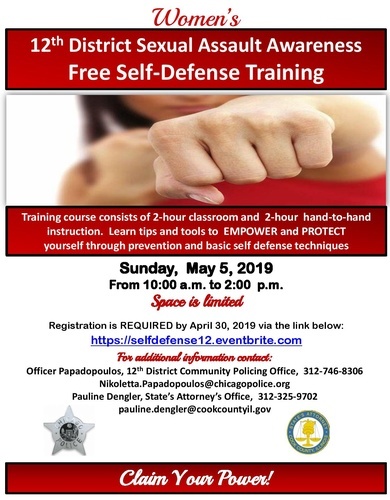 Reality-based self-defense class taught by female Police Officers where you will learn a number of techniques meant to increase your confidence and awareness while protecting yourself in any situation. Recognizing potential dangerous situation and how to avoid them. Attendees should dress in comfortable clothing preferably activewear and gym shoes. Please bring your ID, a waterbottle and a snack! ONLY THOSE WHO HAVE PRE-REGISTERED FOR THE TRAINING WILL BE ALLOWED TO PARTICIPATE. CLASS SIZE IS LIMITED. ONLY REGISTER IS YOU ARE POSITIVE YOU WILL BE ATTENDING. Contact Pauline Dengler at 312-325-9702 or 312-375-5416 with questions regarding this event.